Abseiling, the various techniques used to descend ropes, is an integral part of climbing, but in itself is a fun and exhilarating experience. Whether you'd like to try it for a thrill-seeking day or wish to learn about the whole range of abseiling techniques, we will tailor a course to suit your needs. Come with us and we'll throw you off some of the most exciting and impressive rock faces in the Lake District. Experience the buzz of a free-hanging abseil two hundred feet above the water. Watch your friends disappear into space, safe in the knowledge that you're next! Alternatively, why not head face first down one of the many crags of the Lakes District?! This is a fantastic group activity for any stag or hen weekend at any time of year. Groups of any size welcome. 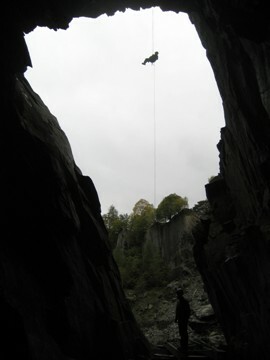 We also offer abseiling for charity and promotional events. The majority of our abseils are located within the Lake District, but between autumn and spring, if you would like to learn more on one of our Sun Rock holidays in the Mediterranean (including Mallorca, Sardinia, Costa Blanca, Corsica), then you'd be most welcome to join us. We also offer weekend breaks to other top quality venues in the UK, including North Wales, The Peak District, Scottish Islands and Cornwall. 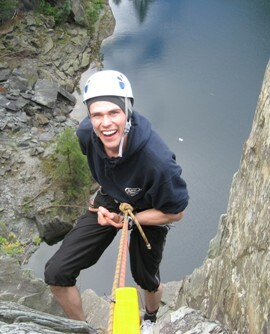 In the Lake District, favourite abseils include: Shepherd's Crag Belvedere, Brown Slabs, and Hodge Close Quarry. Prices for Thrillseekers' Abseiling are per person per day. Descending into the depths of Hodge Close.